There are many board games for persons with cerebral palsy. Even though people who suffer from cerebral palsy may have trouble with fine motor skills, they can still participate in playing board games. Depending on age and ability level, there are many board games to choose from. Trouble- a strategy game. The dice is tossed by pressing on a plastic bubble. Each player has 4 medium-sized pegs that are moved into slots. Scene It? - A DVD based board game. The focus is on watching famous scenes from television and movies. There are many different versions of this game. Players also use a board with few game pieces to track which player is winning. Littlest Pet Shop- players move 1 inch sized plastic pets around the board. The premise of the game is that the pets have escaped without their owners knowing about it. They must race to see who can return home without being caught. Railroad Rush Hour Game- players rush to clear their trains from the track and avoid pile-ups. Large colored trains are the main playing pieces of this board game. The New Touch Game- a sensory game. Players must find and match figures with their corresponding cards. 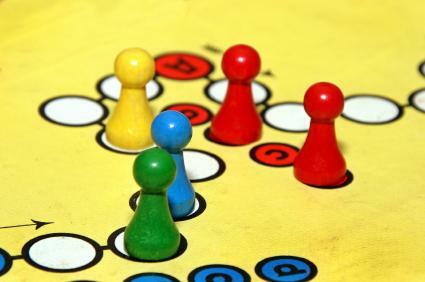 There are other popular games that do not use a game board. These popular games are easy to play and have no small game pieces that need to be maneuvered. The following games are perfect for individuals that have difficulty using their hands to grasp small board game pieces. 20Q Challenge- a fun game of 20 questions. The challenge is to beat the small dome display that seems to guess what you are thinking. If you beat the game after it asks you twenty questions, you will win. Toss Across- players toss soft beanbags onto a large board placed on the floor. This is a variation of Tic Tac Toe. The game has X's and O's that flip when the beanbags are tossed onto them. Connect Four- place your black or red checker in a vertical holder to see who can connect four checkers of a similar color.